Editor’s note: In this and future monthly hay price summaries, we will focus on the Alfalfa Hay price (as we always have) and Other Hay price, which replaces the combined All Hay price in the table below. This will give readers a better idea of what grass hay is selling for. 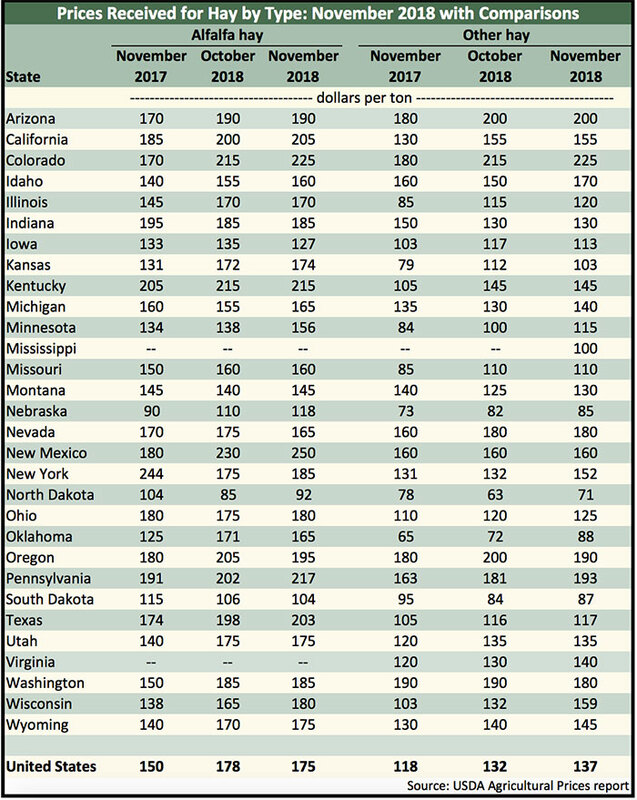 For a state to be listed in the table, a current price for Alfalfa hay and/or Other Hay must be reported by USDA. The release of backlogged USDA reports began last week with their Agricultural Prices for November. 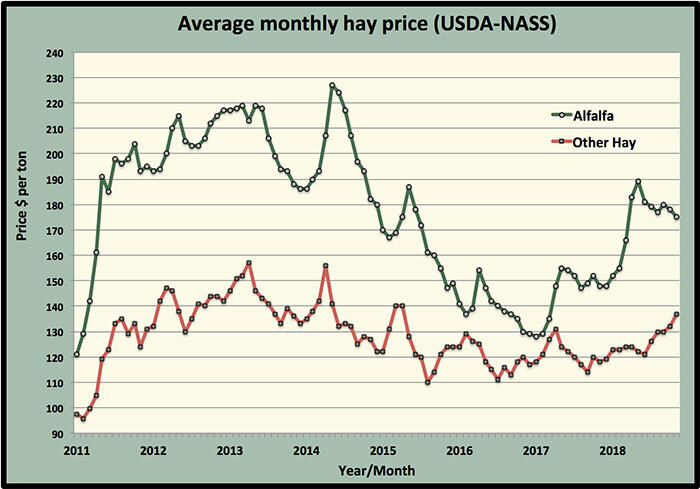 The average November Alfalfa Hay price dropped for the second month in a row to $175 per ton, which was $3 per ton lower than October’s average. The November Alfalfa price was $25 higher than one year ago and $27 per ton above last December. The highest average U.S. Alfalfa price in 2018 occurred in May at $189 per ton. The largest Alfalfa Hay price gainers in November were New Mexico (up $20 per ton), Minnesota (up $18), Pennsylvania (up $15), and Wisconsin (up $15). Colorado, Michigan, and New York were all up $10 per ton. Price decliners were led by Oregon and Nevada, both down $10 per ton. The highest average Alfalfa Hay prices were reported from New Mexico ($250 per ton), Colorado ($225), Pennsylvania ($217), Kentucky ($215), California ($205), and Texas ($203). The lowest prices were found in North Dakota ($92 per ton) and South Dakota ($104). The price of Other Hay moved $5 per ton higher in November to $137, which is $19 higher than the previous year. Other hay has climbed from $119 per ton at the end of December 2017 to its November level. The highest price for Other Hay was reported in Colorado ($225 per ton) and Arizona ($200).